Background: The technique of alternating rotation has been used with NiTi rotary instruments to increase the resistance to fracture compared with conventional continuous rotation. However, it is still not clear what type of instrumentation could provide better results in the preservation of the original canal anatomy. Aim: The aim of this study is to determine the influence of the type of rotation on canal transportation and centering ability using cone-beam computed tomography (CBCT) imaging. Materials and Methods: In total, 50 mesial canals of mandibular molars with curvatures between 30° and 60° were divided into two experimental groups (n = 25 each) according to the type of movement employed with the ProTaper Next (PTN) instruments: Group A (alternating rotation) and Group B (continuous rotation). Canals were scanned before and after instrumentation using a CBCT scanner to evaluate root canal transportation and the centering ratio at 3, 5, and 7 mm from the apex. Data were analyzed statistically using Student's t-test; the significance level was set at P < 0.05. Results: There was no significant difference between the groups in canal transportation or the centering ratio at any of the three studied cross sections (3, 5, and 7 mm). Conclusions: PTN instruments promoted minimal apical transportation and remained relatively centered within the root canal, with no significant difference between alternating and continuous rotation. Mechanical instrumentation in endodontics is aimed at the removal of infected soft and hard tissues from the root canal, creating access for the delivery of irrigating solutions, and a sufficient taper for further filling. The introduction of nickel-titanium (NiTi) rotary instruments has improved the efficiency of endodontic practice in terms of working time, accuracy, and reduction of errors in shaping compared with the stainless steel hand files used previously.,, Despite this progress, instrumentation can still be a challenge in canals with severe curvature. Difficulty preserving the original anatomy and unexpected fractures of instruments are among the problems faced., Against this, several strategies have been developed to improve instrument flexibility and resistance, including various cross-sectional designs, improved manufacturing processes, and innovations in the mechanics of instrumentation. Considering these benefits, Yared proposed an instrumentation technique based on the use of a single file. The concept of using only one instrument for preparing the entire canal is promising because the learning curve is greatly reduced as a result of technical simplification and reduction of the arsenal needed. In keeping with this concept, the Reciproc (VDW, Munich, Germany) and WaveOne (Dentsply Maillefer, Ballaigues, Switzerland) systems appeared on the market, both using a single file specifically designed for use with reciprocating movement. However, when faced with canals with complex anatomies, it is reasonable to think of preparations using multifile systems, progressively increasing the diameter of the instruments to reach the working length with more gradual enlargement, without forcing the file apically., The use of only one instrument to complete the preparation could lead to increased root canal transportation,, and the accumulation of much stress, with the consequent risk of fracture. The ProTaper Next (PTN; Dentsply Maillefer, Ballaigues, Switzerland) multifile system, manufactured using M-Wire NiTi alloy, has among its features, an off-center rectangular cross-section, and asymmetrical rotary motion. It has been reported that these instruments are more resistant to cyclic fatigue than is their predecessor, the ProTaper Universal (PTU) system. Furthermore, lower apical transportation has also been observed in curved canals prepared using PTN versus WaveOne and PTU. To date, no published study has assessed the PTN system with reciprocating motion. The aim of this study was to evaluate transportation and the centering ability in curved root canals of the PTN multifile system used with alternating rotation compared with conventional continuous rotation using CBCT imaging. In total, 50 separate mesio–buccal or mesio–lingual canals of mandibular molars with fully formed apices stored in saline were selected for this study. Furthermore, only canals with an angle of curvature in the mesial–distal plane between 30° and 60° were included in this study. The evaluation of angle and radius of curvature was performed according to the methodology of Pruett et al. The cavities were accessed with Endo-Access and Endo-Z burs (Dentsply Maillefer, Ballaigues, Switzerland), and the working length was established under ×10 magnification using a clinical operating microscope (M525 F40; Leica, Heerbrugg, Switzerland) by inserting a size 10 K file into the root canal until it was visible through the apex and subtracting 1 mm from this measure. Specimens were divided into two experimental groups (n = 25 each), taking care to distribute the angle and radius of curvature equally. Then, the rotational movement applied in the PTN instruments was randomly assigned to each group: Group A, alternating rotation, and Group B, continuous rotation. Canals were instrumented using I-Endo Dual digital electric motor (Satelec-Acteon, Mérignac, France) and a W & H WD-75M 16:1 reduction contra-angle hand piece (W & H, Bürmoos, Austria). Before using PTN, as recommended by the manufacturer, a glide path was created using ProGlider (Dentsply Maillefer, Ballaigues, Switzerland). The following sequence of instrumentation was established with PTN instruments: X1, X2, and X3. Group A was instrumented with an alternating rotation motion of 150° clockwise (CW) followed by 30° counterclockwise (CCW) at a speed of 300 rpm. Group B was instrumented with continuous rotation motion at a speed of 300 rpm, according to the manufacturer's instructions. Instrumentation was completed using a gentle in- and out-motion. Instruments were withdrawn from the canal, and dentinal debris was cleaned with gauze soaked in saline when resistance was felt in their progression. Canal irrigation was performed in both groups with 2 mL of 5.25% NaOCl after the use of each file. Each instrument was used to prepare three canals and was then discarded. Samples were immersed in water and positioned on the CBCT scanner (CS 9300; Carestream, New York, United States). Images were acquired with the following specifications: 90 kV, 6.3 mA, and an isotropic resolution of 90 μm. The field of view was 5 cm × 5 cm. To obtain the cross-sectional images of the canal, CS 3D imaging software (Carestream, New York, United States) was used. Before the initial scan was performed on each sample, three grooves were made in the root surface perpendicular to the root canal at 3, 5, and 7 mm from the apex using a fine diamond disk (0.3 mm) (Komet, Lemgo, Germany) mounted on a handpiece and under the control of a clinical operating microscope (M525 F40; Leica, Heerbrugg, Switzerland). These grooves facilitated the reproducibility of the root canal cross-sectional images obtained in the pre- and post-instrumentation scans. Images were exported in TIF format for further analysis. Measurements were made using Adobe Photoshop CS6 (Adobe Systems, Inc., San Jose, CA, USA). Periradicular area and the lumen of the canal were colored to determine their limit [Figure 1]. The following formula (absolute value) was used to calculate the canal transportation: (M1– M2) – (D1– D2), where M1 represents the shortest distance from the mesial margin of the root to the mesial margin of the uninstrumented canal, M2 is the shortest distance from the mesial margin of the root to the mesial margin of the instrumented canal, D1 is the shortest distance from the distal margin of the root to the distal margin of the uninstrumented canal, and D2 is the shortest distance from the distal margin of the root to the distal margin of the instrumented canal. A result of zero with this formula would indicate an absence of canal transportation. The instrument's ability to stay centered in the canal was calculated using the following formula: (M1–M2)/(D1–D2) or (D1–D2)/(M1–M2). Thus, a ratio was established in which the numerator was the smaller of the two numbers: (M1–M2) or (D1–D2). A result of 1 in this ratio would indicate perfect centering of the canal. Statistical analyses were performed using the SPSS software (ver. 17.0; SPSS, Inc., Chicago, IL, USA). The means and standard deviations of transportation and centering capability in each of the three cross sections in both groups were calculated. Results were compared using Student's t-test for independent samples. The same test was used to assess homogeneity between the groups in terms of angle and radius of curvature. Statistical significance was set at P < 0.05. [Table 1] shows the mean and standard deviation for canal transportation (mm) and the centering ratio at each of the three cross-sections studied. Data for canal transportation were similar for both groups, with no significant difference (P > 0.05). Neither group showed perfect centering ability (=1.0), and there was no significant difference between them (P > 0.05). [Table 2] shows the means and standard deviations for the angle and radius of curvature. Homogeneity between the groups was confirmed, as no significant difference was found (P > 0.05). The application of alternating motion could be beneficial in the shaping of root canals by reducing the screwing effect. This effect is often associated with instruments working in continuous rotary motion, and it may result in overinstrumentation beyond the apical constriction, which is sometimes a cause of canal transportation. Another reason to consider the alternating motion as a more conservative procedure is its similarity to Roane´s balanced forces technique., However, it is unclear whether alternating motion with rotary Ni-Ti instruments shows the same benefits as the balanced force technique with stainless steel hand files. Analysis of the results [Figure 2] of our study on canal transportation and centering ratio revealed no significant difference between alternating rotary motion and continuous rotary motion at any of the three cross sections studied 3, 5, or 7 mm. One possible reason for this could be that the reduction of the screwing effect achieved by the alternating movement was not evident when combined with the PTN instruments, which reduce this effect themselves due to their off-center rectangular cross section and asymmetric rotary motion. The results obtained are consistent with those of You et al. 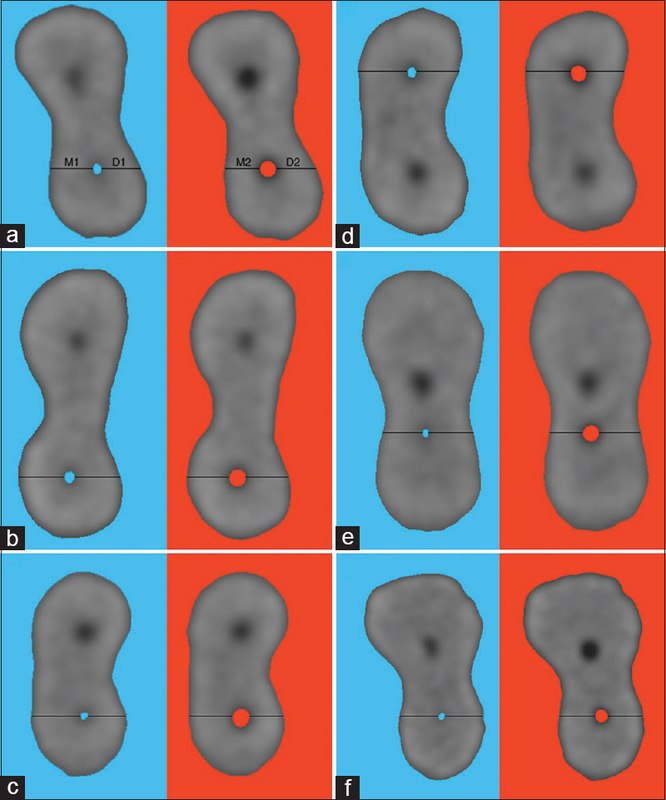 in a similar study carried out with micro-CT (μCT), in which the shaping ability was compared using PTU instruments under both types of rotation. They observed no difference in any of the parameters studied, including canal transportation. In contrast, Franco et al., in a study conducted in plastic blocks, found increased apical transportation with instrumentation performed with continuous rotation compared with alternating rotation. The explanation for these conflicting results could be found in the differences in methodology, such as the study models employed or the reciprocation range (60° CW, 40° CCW) with which the instruments were used. In our study, we selected a range of 150° CW and 30° CCW, similar to that presented by WaveOne instruments, completing 1 cutting cycle (360°) in 3 CCW–CW strokes. This range promotes progression of the instruments in the canal while providing very light apical pressure, sufficient for near-automatic advance. Saber et al. investigated the influence of different reciprocation ranges on instruments' resistance and their shaping ability. They concluded that a decrease in the reciprocating range resulted in increased resistance to cyclic fatigue, reduced canal transportation, and increased centering ability. However, the results for the latter two parameters, canal transportation and centering ratio, showed no significant difference between groups at 1 mm from the apex. In addition, there was a linear inverse relationship between the reciprocating range and the time needed with the instrument to reach the working length, so smaller and more symmetrical ranges made progression along the canal more laborious and extended the preparation time. The values obtained in our study for canal transportation and centering ratio with both types of rotation were similar to those in previous studies, such as that by Elnaghy and Elsaka which evaluated shaping performed using a combination of ProGlider and PTN instruments with CBCT imaging. Zhao et al. used micro-CT to evaluate shaping performance, also showing transportation values with PTN consistent with our study, despite differences in the methodology. According to the observations of Wu et al., apical transportation of more than 300 μm could negatively affect the quality of the apical seal. Our results showed that none of the samples instrumented exceeded this limit at any of the levels studied. PTN instruments promote minimal transportation and remained relatively centered within the root canal, with no significant difference between alternating rotation and continuous rotation. Parashos P, Messer HH. Rotary NiTi instrument fracture and its consequences. J Endod 2006;32:1031-43. Taschieri S, Necchi S, Rosano G, Del Fabbro M, Weinstein R, Machtou P. Advantages and limits of nickel-titanium instruments for root canal preparation. A review of the current literature. Schweiz Monatsschr Zahnmed 2005;115:1000-5. Walia HM, Brantley WA, Gerstein H. An initial investigation of the bending and torsional properties of Nitinol root canal files. J Endod 1988;14:346-51. Martín B, Zelada G, Varela P, Bahillo JG, Magán F, Ahn S, et al. Factors influencing the fracture of nickel-titanium rotary instruments. Int Endod J 2003;36:262-6. Souter NJ, Messer HH. Complications associated with fractured file removal using an ultrasonic technique. J Endod 2005;31:450-2. Malentacca A, Lalli F. Use of nickel-titanium instruments with reciprocating movement. G Ital Endo 2002;16:79-84. Varela-Patino P, Martín-Biedma B, Rodriguez-Nogueira J. Fracture rate of nickel-titanium instruments using continuous versus alternating rotation. Endod Pract Today 2008;2:193-7. Varela-Patino P, Ibanez-Parraga A, Rivas-Mundina B, Cantatore G, Otero XL, Martin-Biedma B. Alternating versus continuous rotation: A comparative study of the effect on instrument life. J Endod 2010;36:157-9. You S, Bae K, Baek S, Kum K, Shon W, Lee W. Lifespan of one nickel-titanium rotary file with reciprocating motion in curved root canals. J Endod 2010;36:1991-4. Plotino G, Ahmed HM, Grande NM, Cohen S, Bukiet F. Current assessment of reciprocation in endodontic preparation: A comprehensive review-Part II: Properties and effectiveness. J Endod 2015;41:1939-50. Giuliani V, Di Nasso L, Pace R, Pagavino G. Shaping ability of WaveOne primary reciprocating files and protaper system used in continuous and reciprocating motion. J Endod 2014;40:1468-71. Ersev H, Yılmaz B, Çiftçioǧlu E, Özkarslı ŞF. A comparison of the shaping effects of 5 nickel-titanium rotary instruments in simulated S-shaped canals. Oral Surg Oral Med Oral Pathol Oral Radiol Endod 2010;109:E86-93. Marzouk AM, Ghoneim AG. Computed tomographic evaluation of canal shape instrumented by different kinematics rotary nickel-titanium systems. J Endod 2013;39:906-9. Plotino G, Grande NM, Testarelli L, Gambarini G. Cyclic fatigue of reciproc and waveOne reciprocating instruments. Int Endod J 2012;45:614-8. Pérez-Higueras JJ, Arias A, de la Macorra JC, Peters OA. Differences in cyclic fatigue resistance between ProTaper Next and ProTaper Universal instruments at different levels. J Endod 2014;40:1477-81. Zhao D, Shen Y, Peng B, Haapasalo M. Root canal preparation of mandibular molars with 3 nickel-titanium rotary instruments: A micro-computed tomographic study. J Endod 2014;40:1860-4. Pruett JP, Clement DJ, Carnes DL Jr. Cyclic fatigue testing of nickel-titanium endodontic instruments. J Endod 1997;23:77-85. Elnaghy AM, Elsaka SE. Evaluation of root canal transportation, centering ratio, and remaining dentin thickness associated with ProTaper Next Instruments with and without glide path. J Endod 2014;40:2053-6. Saber SE, El Sadat SM. Effect of altering the reciprocation range on the fatigue life and the shaping ability of WaveOne nickel-titanium instruments. J Endod 2013;39:685-8. Franco V, Fabiani C, Taschieri S, Malentacca A, Bortolin M, Del Fabbro M. Investigation on the shaping ability of nickel-titanium files when used with a reciprocating motion. J Endod 2011;37:1398-401. Özer SY. Comparison of root canal transportation induced by three rotary systems with noncutting tips using computed tomography. Oral Surg Oral Med Oral Pathol Oral Radiol Endod 2011;111:244-50. Al-Rawi B, Hassan B, Vandenberge B, Jacobs R. Accuracy assessment of three-dimensional surface reconstructions of teeth from cone beam computed tomography scans. J Oral Rehabil 2010;37:352-8. Grande NM, Ahmed HM, Cohen S, Bukiet F, Plotino G. Current assessment of reciprocation in endodontic preparation: A comprehensive review-Part I: Historic perspectives and current applications. J Endod 2015;41:1778-83.
de Carvalho GM, Sponchiado Junior EC, Garrido AD, Lia RC, Garcia Lda F, Franco Marques AA. Apical transportation, centering ability, and cleaning effectiveness of reciprocating single-file system associated with different glide path techniques. J Endod 2015;41:2045-9.